We know, it's a rough morning after a late night out. Luckily, as a public service to the hungover, every week we track down the best bartenders in the country and ask them to share their favorite hair-of-the-dog remedies. This week, a glassful of lager to help the medicine go down, from a restaurant that has quickly become a Chicago institution. ITS ORIGINS: Bitters—botanical-infused spirits—have been used to calm restless stomachs for millennia, and they work wonders on a hangover, too. They awaken the digestive system by encouraging the flow of saliva, gastric acid and bile through the gastrointestinal track, making for a happy and healthy gut. Unfortunately "bitter" isn't very palatable to humans, who much prefer "salty" and "sweet" and "alcoholic." Ancient Egyptians solved that problem by storing their medicinal herbs in wine. Pretty much everyone else caught on, such as the English, who spiked Canary wine with restorative plants, because booze made bitter, homeopathic medicines much easier to swallow. ITS HEALING POWERS: Poli got the idea for his Brunch Box cocktail, which is rich with bitters, after watching guests at a wedding guzzle Lunch Box cocktails, a mix of Amaretto, orange juice and beer. "People were just slamming them down," he says. 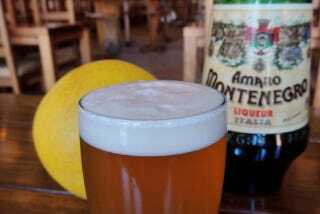 His version includes Amaro Montenegro, grapefruit juice and a classic lager beer. The Amaro Montenegro is an amber-colored Italian bitter made with more than 40 herbs and spices including vanilla and orange peels. It is a popular digestivi. "The Amaro has a citrus character," Poli explains. "It's a little sweet, but it's still bitter, which is great for digestion." The fizziness in the beer, much like in seltzer, can also help soothe the stomach. Plus, the promise of a glass of beer makes the "bitter" swill more approachable to drinkers, Poli says. He uses whatever lager is on tap, which is currently the Krombacher, but "any clean, crisp, refreshing lager will do." And like the best medicines, the quicker you drink the Brunch Box, the quicker you'll feel better. "It's cold," Poli says. "It's slightly sweet. And it comes in a 7-ounce glass. People definitely order more than one." DON'T TELL THE OWNERS: "Sometimes if the staff is in the middle of a busy service and everyone is really stressed out, we call a side meeting and drink a few Brunch Boxes. It makes everyone feel a little bit better." THE METHOD: Mix chilled Amaro and grapefruit juice in a 7-ounce Collins glass. Top with cold lager.